We presented“Molecular NINJA ”system at Biomod 2011. It is a system of molecular walker which walks in a ditch made of two DNA origamis. We designed DNA origamis which has a ditch that the molecular NINJA can hide in and guides its route. However, we were not able to achieve this plan. We will take revenge of last year's project. Our project title is"Molecular NINJA Returns". Key point of the project is a metamorphosis like ninja. We prepare without the addition of one row of vertical staple DNAs that make up the DNA Origami.There are bare base pairs in the space of lacking staples. Stacking interaction occurs between them and shrink the original structure. Using this phenomenon, we attempt to construct a DNA origami which has a capability of transformation like using "ninjutsu". Our previous strategy of the robot contest was making a walking system using a ditch. Self-walking molecular spider (Fig. 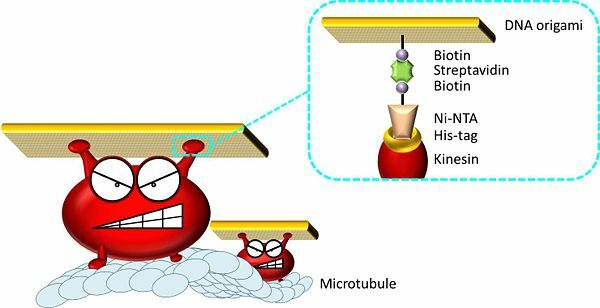 1) that we called “Molecular NINJA” because walking in a ditch is like NINJA walks on water, was selected as the molecular walking system. It is reported that it is possible to tightly trap a guest using well. So the walker can walks in a ditch without suffering damage from physical tapping by AFM probe. The detailed method was as follows (Fig. 2). Fig. 1. Schematic image of the molecular spider. Fig. 2. Animation of our project strategy. In this project, DNA origami can be transformed like NINJA's skill, "ninjutsu". We design the transforming DNA Origami. The transformation is based on π-π stacking interaction between intramolecular blant-ends. By making DNA origami without staple strands on few vertical lines, shrunk DNA origami is formed (Fig. 3). Fig. 3. Schematic image of shrunk DNA origami. Fig. 4. Schematic image of Diagonal shrunk DNA origami. Fig. 5. Schematic image of Zig-Zag shrunk DNA origami. This image is popular smiley DNA origami. Not using staple strands shown in middle of Smiley DNA origami, middle lacking Smiley DNA origami formed the one-eyed monster called “Cyclops” by intramolecular-stacking. We named cyclops DNA origami. Adding staple strands, cyclops DNA origami is expected to transform the smiley DNA origami. Fig. 6. Schematic image of the Cyclops to Smiley DNA origami. Using above method, it will be possible to make DNA origami having a capability of shape selective capturing. We designed shape selective capturing DNA origami which is consist of two U shaped regions connected by single stranded DNA. This architecture will form Origami with the square hole in the center by π-π stacking interaction. However, this DNA origami might be able to selectively catch another complementary shaped DNA origami to maximize π-π stacking interaction. Fig. 7. Schematic image of the Bear Trap DNA origami. Fig. 8. Schematic image of the Bear Trap DNA origami catching Plus shaped DNA origami. 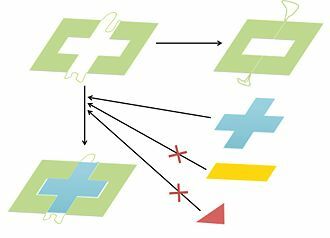 DNA origami is folded by the strong power of static self-assembly between complementary base pairs. In addition it has been known that the weak power, like π-π stacking interaction can form assemblies of DNA origami. However the assemblies cannot maintain its structure that long (~5μm) because of the thermal fluctuation. So creating a large structure(10μm~) of assemblies of DNA origami with the weak interaction seems to be challengeable topic. With weak intermolecular force and microtubule rail track system, we aim to not only attach DNA origami but detach. Fig. 9. Schematic image of kinesin carrying DNA origami. Fig. 10. Shematic image of kinesin walking with DNA origami. Fig. 11. Schematic image of phisically transforming by round trip of Kinesin. This page was last edited on 29 October 2012, at 03:27.